Do you have any good decorating tips for growing and displaying houseplants. We used to have quite a number of them in our living room on plant stands along our picture windows and one of our un-used sliders. In an effort to "tiddy" up we got rid of most of them. now we just keep a few here and there. depending on your budget, you could so something like this http://garden.lovetoknow.com/wiki/Greenhouse_Window I like Natalies suggestions and would add that lighting can really add to the affect of house plants. 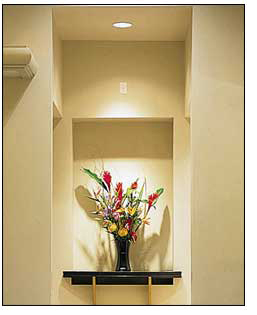 http://www.lampsplus.com/htmls/RecessedLanding/images/accent-01.jpg http://img.ehowcdn.com/article-page-main/ehow/images/a08/a1/5s/hardy-lowlight-house-plants-800x800.jpg http://4.bp.blogspot.com/_dLSVgS5AxBI/TK2IBiLKQQI/AAAAAAAA1rw/-jWexgHqlZY/s400/Indoor-Gardening-Design-Ideas.jpg How big are your house plants? Are you talking about Kalanchoe/African Violets size or Ficus/Peace Plant .Sheffelera size? Generally speaking on care of your house plants: Look up the requirements on light, water and soil preferences on the specific plants that you have. African violets won't like being treated like a orchid and visa versa. African Violets don't like water on their leaves, Orchids do. Follow the advice for your specific plants in regards to fertilizer as well. If you over fertilize you will build up salts in your soil and kill your houseplants. Be sure you don't put them in directly under or over an air vent (ac or heat). Always have good drainage in the pot and depending on the plant try to keep the drip saucers dry as well. Turn your plants a quarter of a turn weekly to keep them from growing too much to your light source and getting loppy sided ((technical term) It is handy on the larger pots to have them on some type of roller affair so turning them is not such a big deal.Keep all dead leaf debris picked out of the pots. this helps control bugs and diseases. Keep a vigilant eye out for bugs and jump on eradication as soon as you see signs of trouble. The worst culprits are spider mites, aphids and white flies. Botrytis (fungus) will need to be dealt with quickly as well. You will need to periodically(depending on the plant) to re pot and replenish the soil. if they become difficult to keep watered, you know your plant has become root bound. You will need to take the plant out and divide, or root prune as well as prune above ground. Re pot in fresh soil. There is more I could at to this, but don't want to get too windy and scare you off! Linda, colorful containers are my thing, and you can buy them in different sizes, Cluster small plants together in corners. Large palms and banana type of plants create very good focal point indoors. Growing & displaying can be two different things. Displaying takes people like Yamini & Natalie who have the talent for placement. 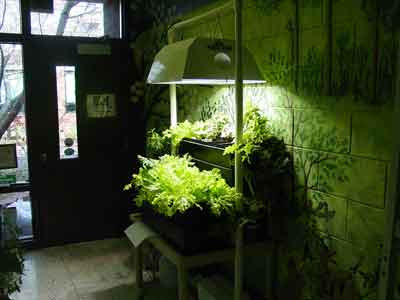 Growing depends a lot on how much light, food, water, nutrients the plants will get. Light should be the first thing you look at when considering placement. My best advice is to find a good, large nursery in town with a good selection of houseplants year-round. It might be a little more expensive than Home Depot, but worth the price. Also get to know someone sharp and helpful there. You might even find a master gardener who can help you. Don't be discouraged if you kill something. It's just a chance to go back to your friend at the nursery and find something new.